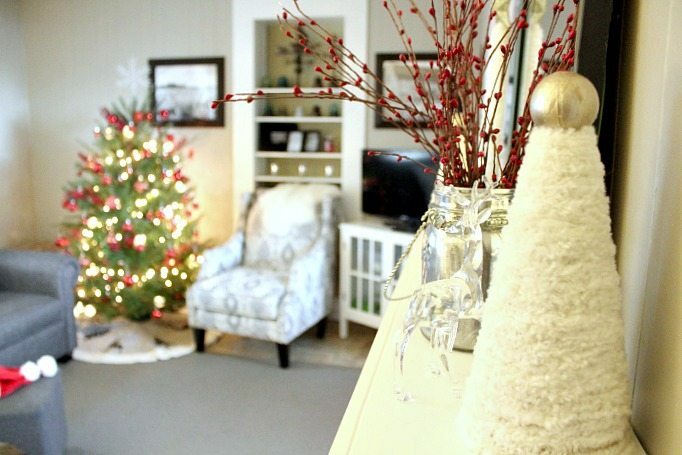 OK, so I really wanted to do a Christmas home tour this year. Firstly, because we just got new living room furniture and I kind of wanted to show it off. 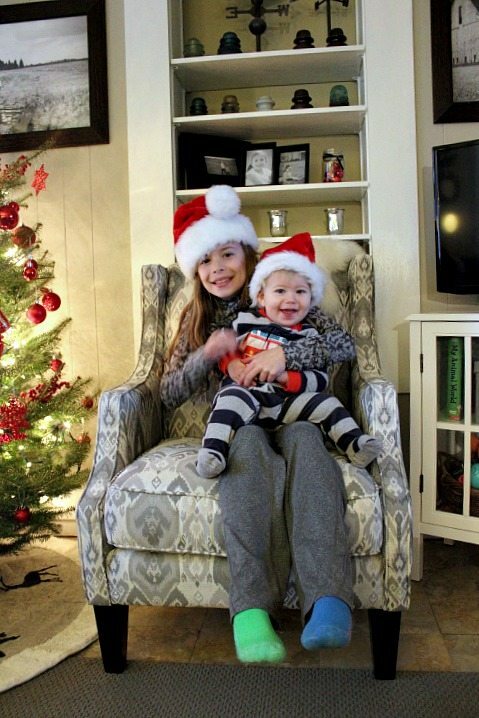 Secondly, because I really enjoy seeing the home tours that other bloggers put together this time of year even though they kind of make me feel bad about myself. Thirdly, I don’t want to make people feel bad about themselves so I’m sharing how un-fancy I really am with my decor this year. Fourthly…. well there is no fourthly, but Chris always gets mad at me when I make lists of only 2-3 items. So I tried. Anyway, with out further ado, here it is! So, I have to be honest with you, even though I only spent a total of maybe 5 minutes decorating this year, I actually really really love how our house looks right now more than ever before. Everything is really simple and tidy and just calming. I like calming these days with a 1-year-old and a bathroom completely torn apart to deal with. So I know that it doesn’t provide quite as much inspiration as a whole well-thought-out-and-complicated decor scheme, but I like it so that’s what you’re getting. I totally reserve the right to go complicated next year though if the mood strikes! Now that we have four people in our house, we decided it was time to trade up to a sectional. We got rid of the coffee table for now too because we didn’t love it anymore and it just wasn’t really baby friendly. It seems wrong not to have a coffee table to decorate, but I’m sure this phase will only last a few months! 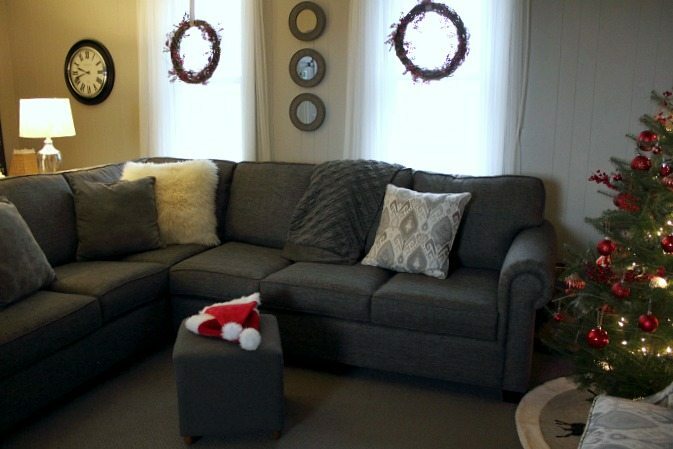 Here’s the post about my living room from a few months ago, so you can see the difference the new sectional made. And this chair! Ack! I love it so much. I got to pick whatever fabric I wanted and I’m so glad I went just a little bit bold with this one. I really love fancy and complicated Christmas trees, but I just don’t have the patience to do them myself at this point in my life. 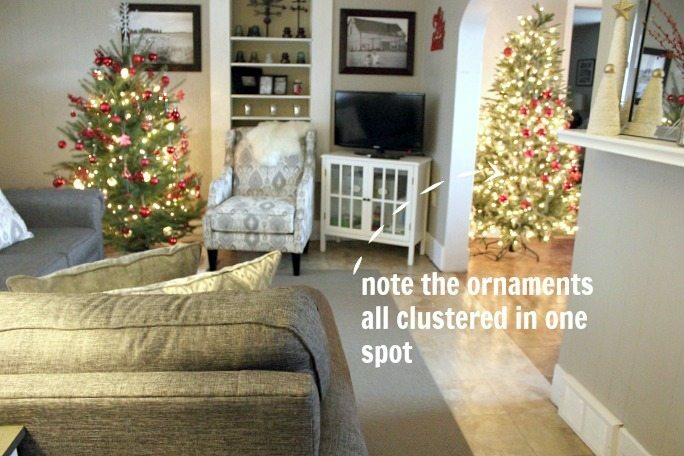 So even though we have 5 trees this year, they’re all super super simple. We don’t use the recommended 100 lights per foot of tree. 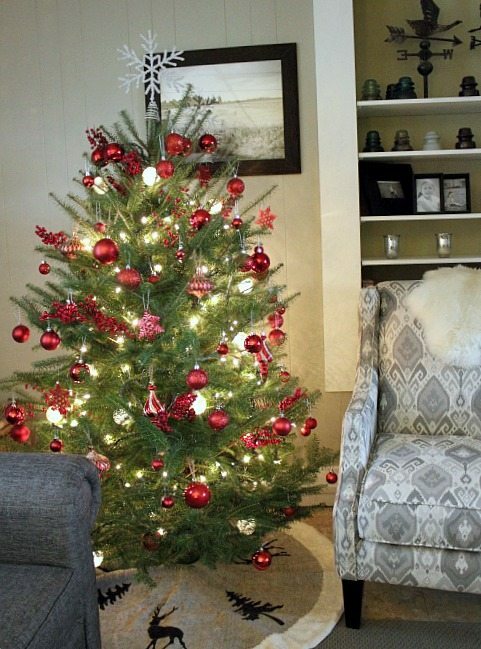 In fact, I think there are probably only 2 strings of 100 per tree, plus some patio lights for fun. I really do love the look of letting the natural beauty of the real trees shine through though. 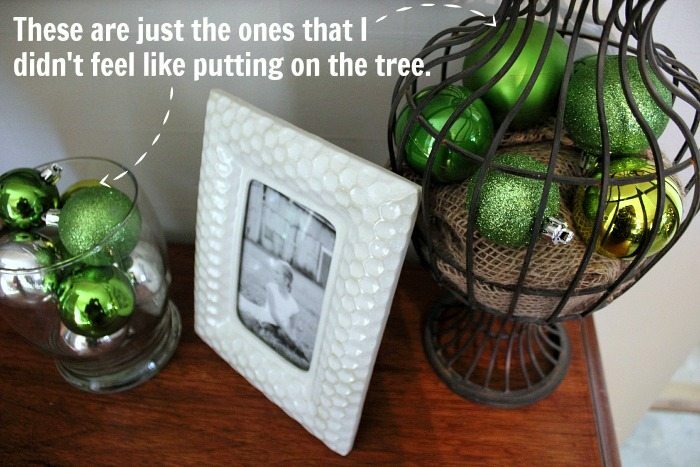 I almost think I could not decorate them at all and I’d still love having them in the house. All I did this year was put in a few berry picks to match the red berry wreaths I made a few weeks ago, and then I handed Kennedy the bag of red ornaments and said “this is the red tree”. 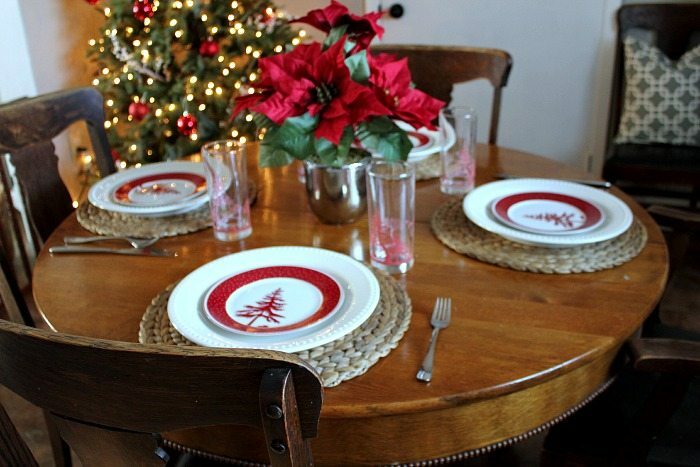 We thought we would make the fake tree in the dining room a red tree too to match. Kennedy did it in her own way. Oh well! 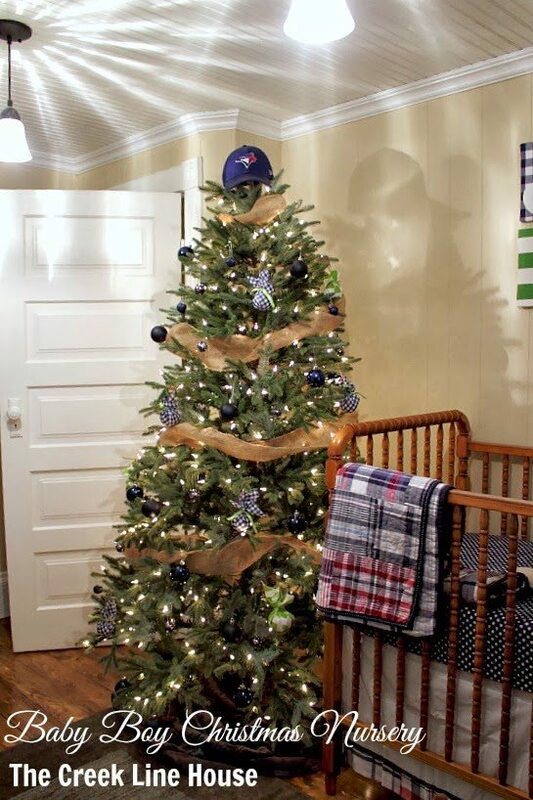 That tree doesn’t even have a skirt on it and I probably won’t get around to finding one for it this year. Less mess though for sure! Oh. and. This is super shameful. Baby Jack doesn’t even have a stocking out yet because I wanted to use these ones but I only have three. Oh well, I’ll put out a non-matching one for him on Christmas Eve and he won’t care. I would have put some fresh cedar into these for now if I had wanted to walk the 20 feet from my back deck to cut some. But I didn’t. We’re working on making the dining room presentable right now so I can only let you see a tiny bit. We’ll have to save most of it for a future post! 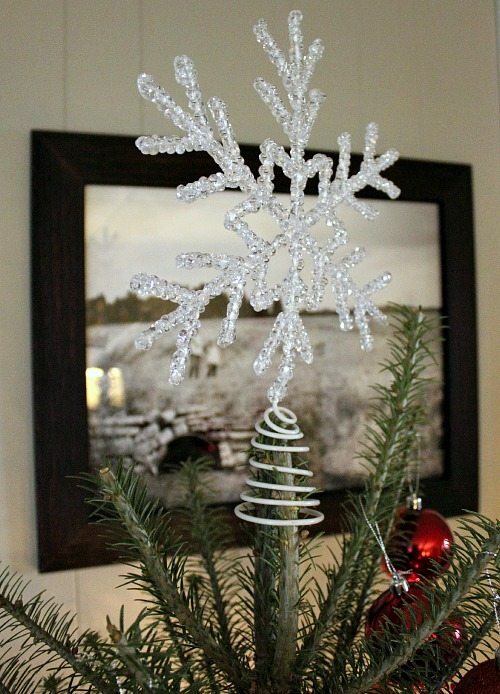 You can see that I took these pictures the next day though and I had fixed up the tree a little by adding in some white berries and spreading the ornaments out. Also, the baby gate that Chris made from an old crib was up like it normally is. That poinsettia is super fake, which works for me because that means that it will last more than three days. We have another real tree in the kitchen. 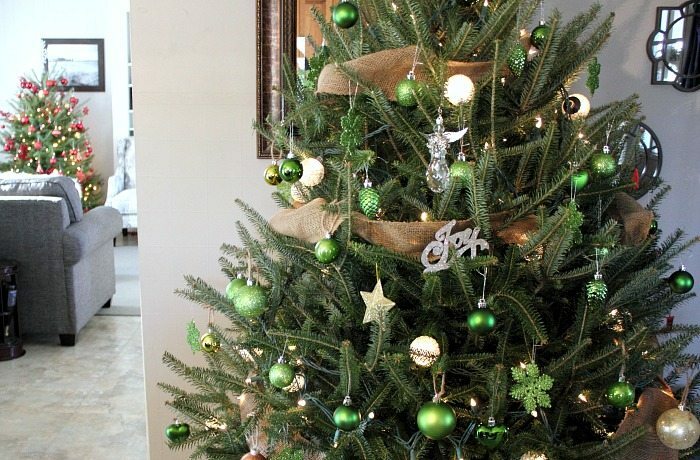 For this one I just handed Kennedy and her friend a bag of green ornaments and a bag of gold ornaments and said “Go nuts!” That’s my kind of tree decorating! The girls got bored of decorating the tree eventually and I didn’t have time to finish the job, so I just stuck the extras in some containers on the kitchen desk. It matches her room, but other than that it’s pretty sad. I tried to get a nice picture of it but that angle just doesn’t exist! That was back when he was like 5 minutes old and slept all the time. Good times! 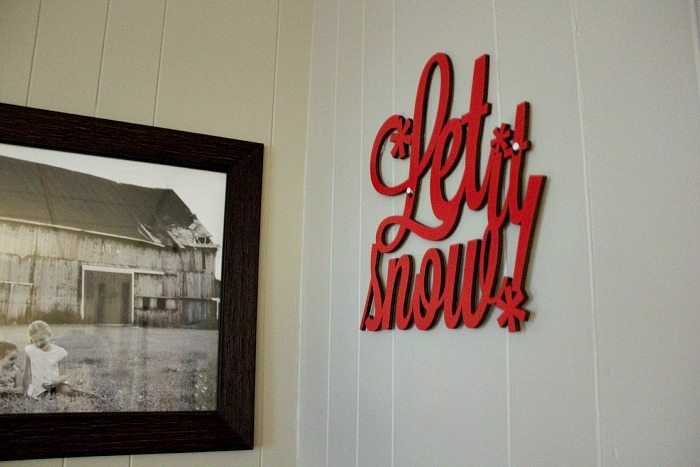 In years past I’ve done fun things in the mud room like this all red mud room. 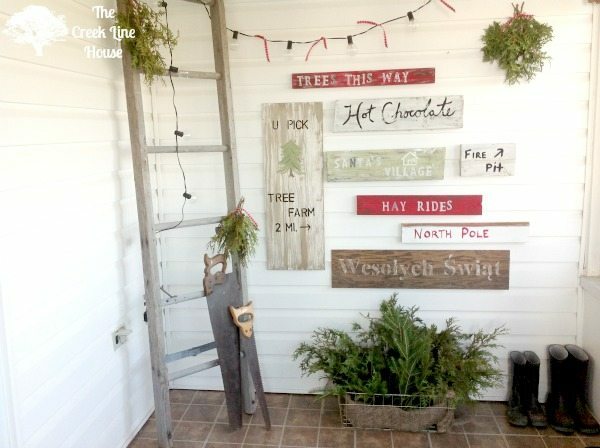 And this tree farm inspired mud room. But this year? Nothing. And my heart truly isn’t breaking over it. Sometimes you’ve just got to let go of all of your type A over-the-topness and just enjoy the season for what it is, right? I’ll almost definitely return to my time-consuming decorating ways next year when Jack is in preschool, but for this year, I’m enjoying things just as they are. I hope you enjoyed your little tour too! Have a great rest of the holiday season! I love how simple this is! 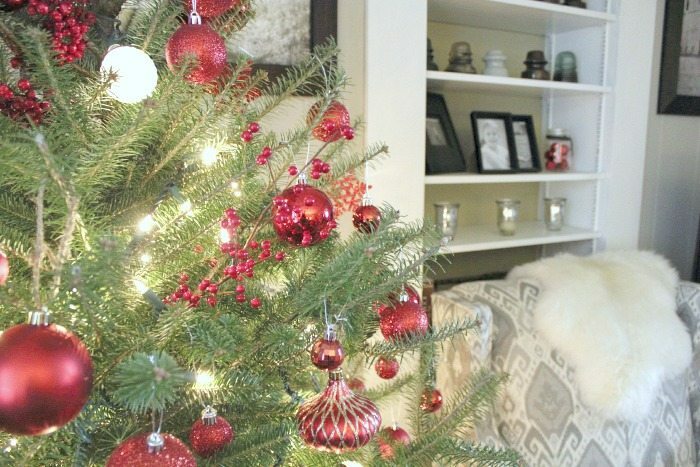 Makes it look so clean and comforting, with the perfect amount of holiday spirit! 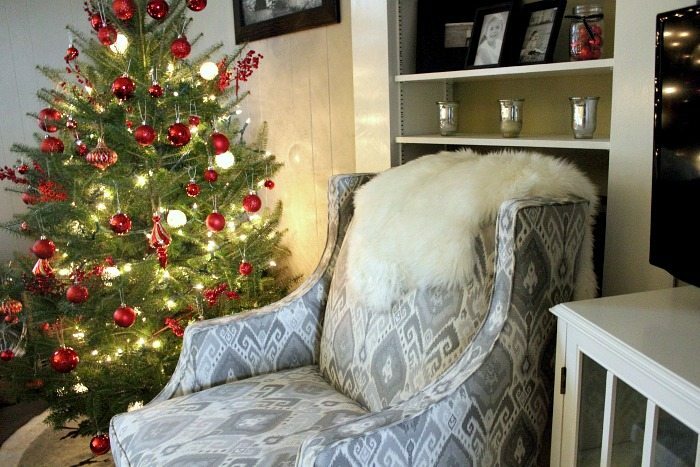 Plus, can you puhleeeeeese divuldge where you got that gorgeous chair, or even the fabric. I am in love. Yay! I’m so glad you like it! 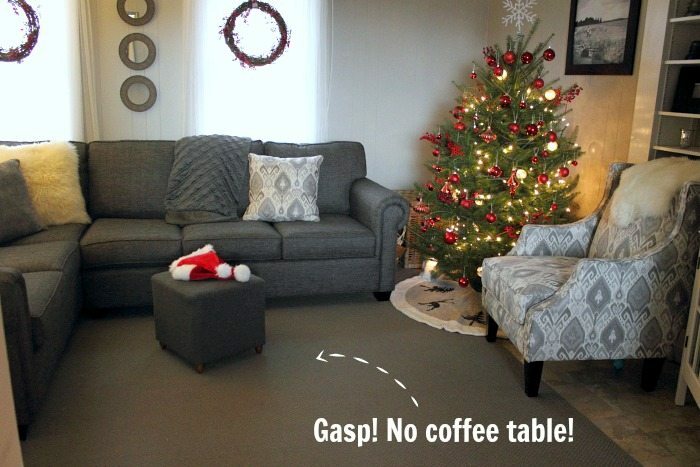 It’s from a popular Canadian furniture company call decor-rest. It seems like their stuff is sold in pretty much every big box furniture store here. Anyways, I always love grey ikats for some reason, so when I saw that that was one of the options I jumped on it. I was a little scared that it was too fancy for me, but I love it now! I love that you just let Kennedy go nuts – I bet she had a ball! 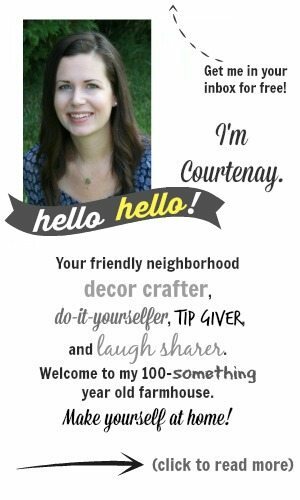 Love your warm and cozy home, Courtenay!! Sounds like your priorities are in the right place — your son won’t be a baby for long — you’ll blink and he’ll be off to kindergarten…..then college…..then married….and then you won’t be his favorite female anymore! 🙂 My son and daughter are both grown, married and living wonderful lives of their own, so I speak from experience. 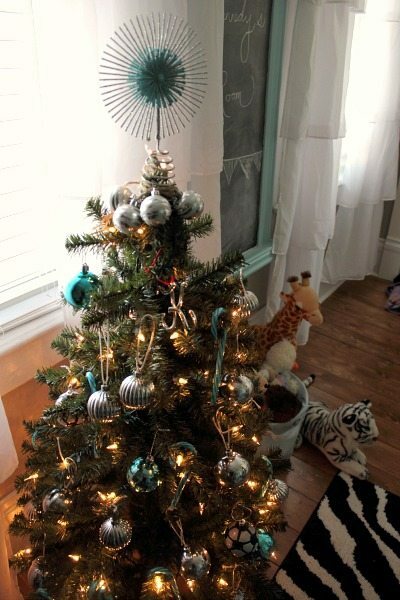 There will be PLENTY of Christmases to come to put on the glitz. 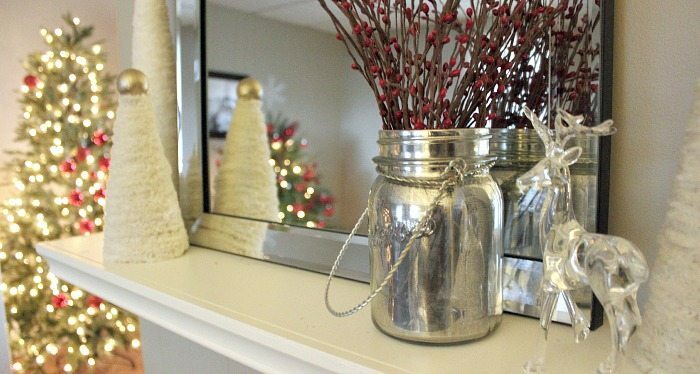 However, I still enjoy the simple decor; it takes only about an hour to put it all away after Christmas — so easy peasy! Remember, Christmas isn’t about OUR birthday — it’s about the birthday of Jesus, the Savior of the world! I haven’t really decorated anything yet. 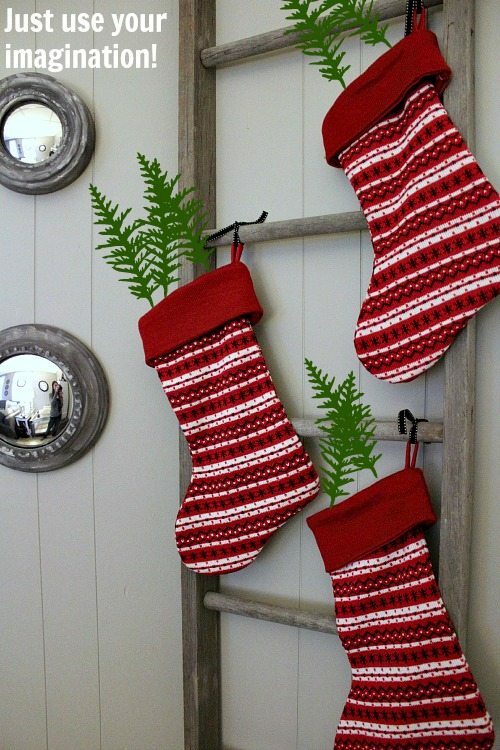 Let me give you a little hint, if you find a Christmas stocking you really like – get EXTRAS. I have one each for my 3 sons but had to find somewhat matching ones for one wife and one girlfriend. I have been lucky, they are not exactly the same but the same knit theme. Don’t be so modest! I love it when “regular” people show off their homes and decorating skills. It’s so much more real than looking at “perfect” styled pictures in a magazine or on a website. 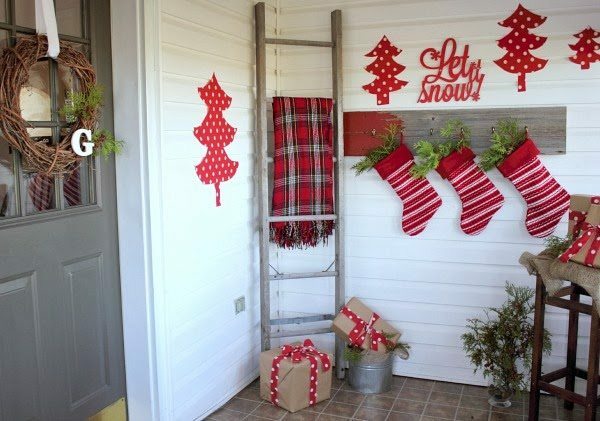 Very lovely, happy Christmas decorating. Thank you for sharing. 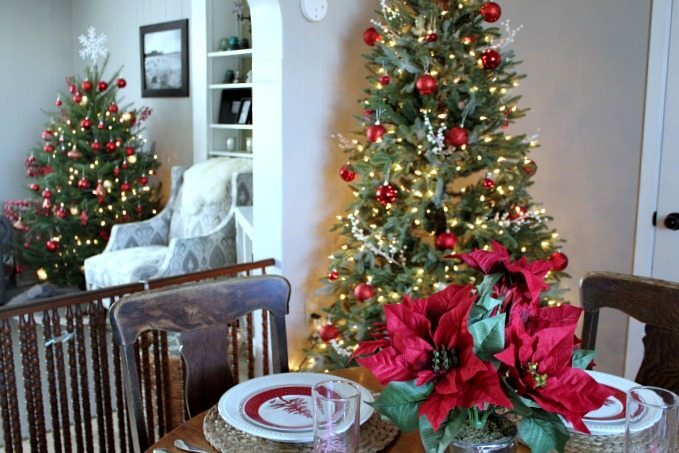 I’m so jealous you have two trees, I just couldn’t fit tow this year in our new house-everything looks amazing though! …yeah two would be awesome. We have 3, and then 2 smaller ones. I think that starts to categorize us as nuts. They are pretty though! Thanks so much for visiting, Melissa!! I do have one criticism and that is, that you sounded as if you were constantly apologising because, in your mind, it doesn’t meet up to the standard of other bloggers. Courtney never apologise for something like that. 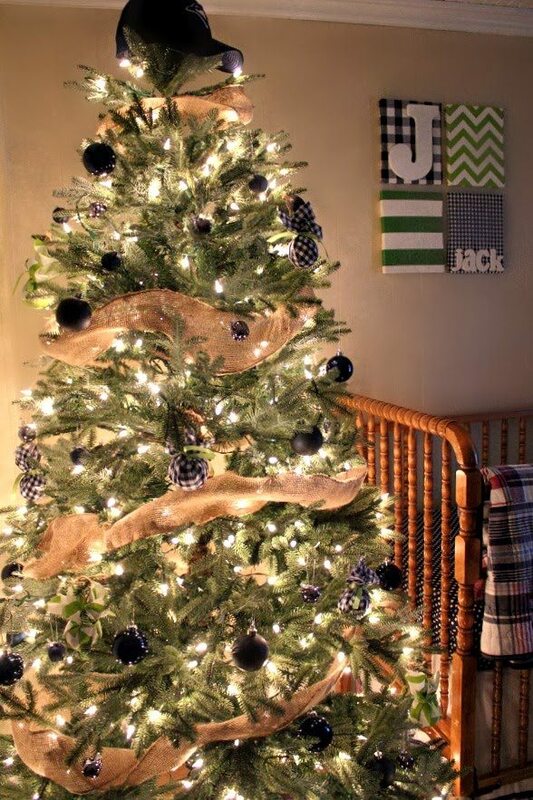 How you have decorated is beautiful and so very tasteful….and you probably did it all with a baby on your hip 🙂 . Also remember that, I for one, love your blog because of your down to earth attitude and your very real approach to decorating. Merry Christmas. Hi Erin!! Good luck with #2! I’ll get a post together on that as soon as possible! It really is a handy thing for us because we can remove it without having any marks on the wall, it’s sturdy, it’s pretty, and it covers a huge doorway, which most baby gates do not. I know you won’t be needing one for a few months yet, but I’ll try to get some info posted about that for you right away anyway. I hope you had a wonderful Christmas and New Years!! #2 arrived on his due date here, so we are back into the world of spit up and diapers! Congratulations!!! There are worse worlds to be in, that’s for sure. Try to enjoy it as much as you possibly can! Watch lots of netflix while cuddling the baby! I don’t know who the other four people are, haha! Someday, I’ll get around to fixing those. 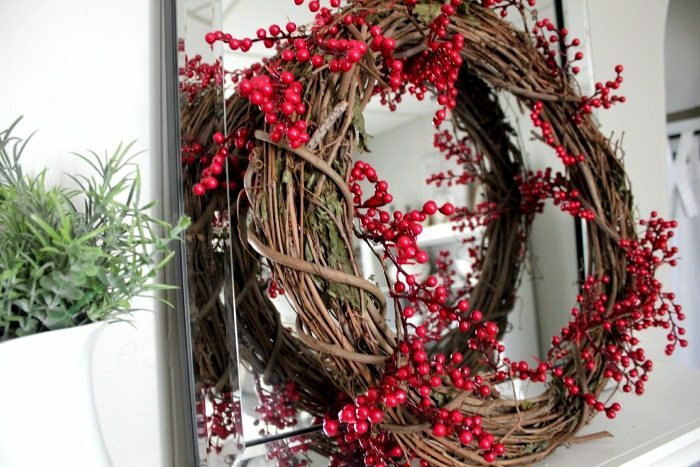 you proved Christmas doesn’t have to be fussy to be beautiful.